Les Petites Abeilles is a small recently created brand of fine children’s clothes, designed and (hand)made in Brussels. Inspired by vintage baby fashion, its dresses, dungarees and other delicate garments literally plunge you into a romantic and nostalgic universe that leads you to forget you are a modern busy mother ! The retro fabric, smocked clothes and charming details of every piece make this little brand very special, and still quite affordable, considering the clothes are mainly handmade in Belgium (the average price for a dress is 50€). Last week, Les Petites Abeilles lauched its first Haute Couture Collection at the somptuous boutique Ladurée on the Sablon, the perfect location to enhance its charm. The little fashion show was perfectly orchestrated between champagne rosé and macarons ! No wonder the little Prince George wore Les Pettes Abeilles on his first official public appearance ! Désirée, the creator and designer of Les Petites Abeilles, is the mother of a 2 years old little girl, Félicité, and lives in Brussels. She tells us about Les Petites Abeilles and herself. – When and how did you start this project? It is a project that I had been thinking about for a long time, and that I launched in 2013. Many friends around me were having babies and I just couldn’t seem to find the perfect baby gifts I was looking for, so I decided to launch my own baby clothes brand. 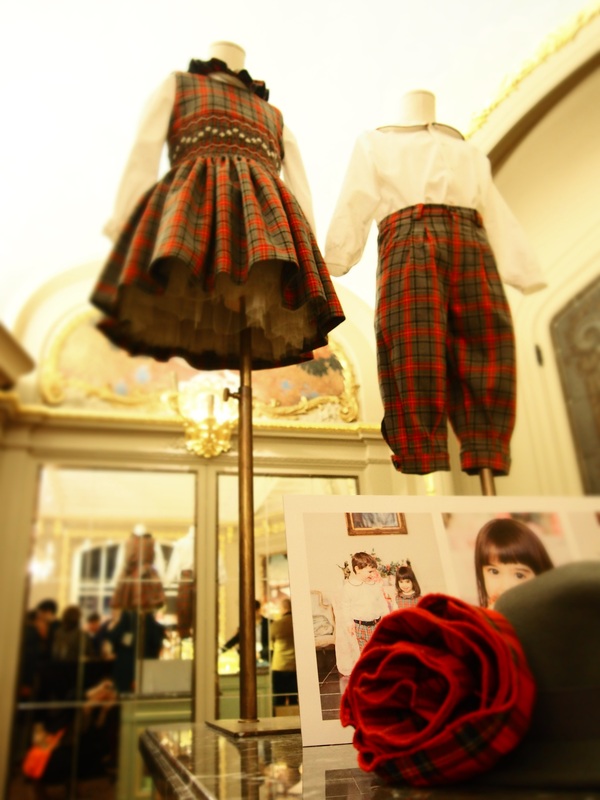 My dream was to dress children like real children rather than like mini adults, to create a fairytale wardrobe. The demand started growing and we decided to dress children from age 0 up to 8 years. – Where do you find your inspiration? I find my inspiration in vintage children’s clothing. I love the 50’s, 60’s and 80’s children’s fashion. Sometimes I find my inspiration when choosing the fabric, sometimes when I see a child, or a painting, anything could be a source of inspiration. For this particular Haute Couture collection, I absolutely wanted to pay a tribute to Marie Antoinette who was a fashion icon at her time. This is how it occurred to me to use the so called ‘toile de jouy’ which was a very popular fabric in the 18th century. As for the blue dress and matching boys dungarees I fell in love with the color of the fabric. Later I found some beautiful antique lace which worked very well with the blue color. The dress makes me think of the Little Lors Fauntleroy. i love tartan, I think Vivienne Westwood did an amazing job in reinventing the tartan pattern and I felt like reinterpreting it too for my children’s collection. – I understand most of your clothes are made in Brussels, is it something you would like to keep doing if your collection would grow? For the Haute Couture 2015 collection, all of the clothes are designed and made in Belgium. I loved working with the atelier Mulieris and I will no doubt work with them again. – To whom do you address your collection? My collections are usually meant to be worn on special occasions. The biggest reward (apart from little Prince George of Cambridge wearing Les Petites Abeilles) was to go to a children’s birthday party, and see all the little girls dancing and swirling in their Les Petites Abeilles dresses. Coincidentally they all were wearing different designs and different colors, this was a very happy moment for me, it was an image out of a fairytale. – What can we expect for the future? Do you plan on going further with the Haute Couture or do you favour the ready-to-wear collection? I have until now fulfilled one dream after the other with Les Petites Abeilles and I am hoping to continue to do so, but I only talk about my dreams once they are fulfilled. The Haute Couture collection is defenitely on for next year; we have already received quite a few orders and this is very encouraging for us; I’m looking forward to seeing the pictures of the little girls wearing the designs. I also have plenty ideas for next year’s ready to wear collections, I will develop both collections in paralell. – You are also a new mother living in Brussels if I am not mistaken. What do you like or find difficult about being a mother in the city? I love the fact that there are many green spaces, that Brussels is very international and multicultural and that people are generally relaxed about you taking your toddler along (almost) everywhere. – What are your favourite spots/activities in Brussels (with and whithout your daughter)? I very much enjoy music and recently discovered a place where you can listen to music and take your children along (origami classics at Beursschouwburg). I recently discovered a sunday brunch place which is very children friendly John and Rose on rue de Flandres. But our favourite activity of all is strolling around place du jeu de balle on a sunday, we never come home empty handed, and always with a smile. Previous Post La folle journée de Valentin – concours! Next Post On fait quoi ce WE de Pâques ?